Malaysia's Perhentian Islands are absolutely beautiful, but there are some tricks to staying happy and thriving in paradise. The two most popular Perhentian islands, Besar (big) and Kecil (small), are as different as night and day: Choose wisely or plan enough time to enjoy both. From avoiding rip-offs to finding the best snorkeling on the island, these Perhentian Islands tips will enhance your experience in one of the most popular places to visit in Malaysia. Long Beach or Coral Bay? When going to Perhentian Kecil, you'll have to choose and tell your boatman if you intend to get off at Long Beach—the "party" option on the east side of the island—or at Coral Bay, the quieter option on the west side of the island. If you aren't sure, a 15-minute jungle trail connects the two beaches. Much of the trail is brick now, but dragging luggage along won't be much fun. Coral Bay has a boat jetty. If you choose to arrive at Long Beach, the most popular option, you'll have to jump over the side and wade ashore in knee-deep water. The speedboat ride from Kuala Besut to the Perhentian Islands can be a wet, loud, spine-adjusting experience. The boat pilots seem to enjoy the opportunity to thrill—and soak—passengers. Waterproof your valuables and try to sit toward the middle or rear of the boat. The frequently choppy seas keep the front of the speedboat (and passengers) in the air more than in the water as the pilot jumps waves then crashes down with a spray of water. When arriving at Long Beach, you'll stop just short of shore and be expected to transfer with luggage into an even smaller boat. The new boat will take you all the way to the beach; people with physical handicaps may have trouble changing from one bouncing boat to another at sea. You'll have to pay the new boatman an additional fee for the trip ashore. Keep your ticket; the fare includes the return trip to Kuala Besut. If you lose your physical ticket, you'll most likely have to buy a new one. There are plenty of places to stay on Perhentian Besar, but accommodations, particularly the cheapest places, fills up quickly on Perhentian Kecil during the high season between June and August. Most budget hotels do not take reservations in advance; arrive on the island as early as possible to grab rooms as people check out. 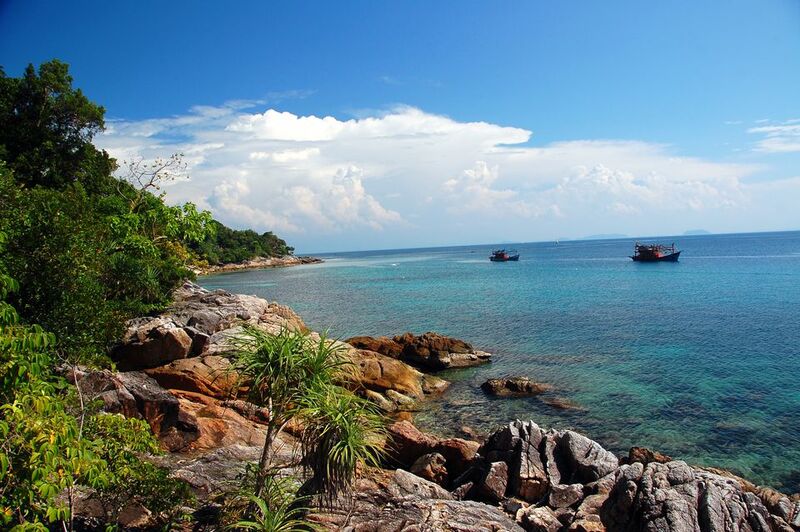 The Perhentians are nearly closed during the winter months when seas are too rough to bring over people and supplies. Although you can still charter a boat from Kuala Besut, expect far fewer options for eating, sleeping, and activities on the islands. You may be nearly alone on the Perhentians between November and February. Although not an official tax, remember that it costs more to bring goods to a remote island and that additional expense is passed down to the customer—you. Smart budget travelers know to save all their big purchases for the mainland and bring adequate supplies of toiletries and consumables to the island. There are no ATMs on the Perhentian Islands, so bring plenty of cash from the mainland. In a pinch, some dive companies and upscale hotels offer cash advances with credit cards for a steep commission— as much as 10 percent or more. Don't expect to rely on an ATM or your credit card while in the Perhentian Islands. You may also be able to exchange major currencies at the same dive shops. Matahara on Long Beach provides currency exchanges. Power in the Perhentians still comes from generators that can come and go on a whim; blackouts are common—especially in the afternoon. Some resorts only have power at night. Keep a flashlight with you when walking after dark, and don't leave electronics unattended in your room while they are being charged. Generator starts sometimes cause power sags and surges that can damage laptops and phones. The satellite-based internet access and Wi-Fi in the Perhentian Islands is slow and expensive—a great excuse to unplug and enjoy paradise for a while. Cellphones do work on many parts of the islands but not everywhere. There are plenty of dive shops scattered along Long Beach and a couple in Coral Bay. Visibility around the Perhentian Islands during the summer months is often excellent, particularly at the dive sites farther out. Reef sharks and other interesting marine life are common. Prices for diving in Malaysia are very competitive. Beach kiosks offer snorkeling excursions to nearby spots by boat. Prices are fair, and you're almost guaranteed to spot turtles and harmless-yet-sizable reef sharks. When booking, ask about how many people are booked for your time slot. If you'll be joining only a handful of others, you may end up in a small speedboat without a shade cover—bad news for people susceptible to seasickness. The larger boats are more stable and offer protection from the scorching sun. Snorkel gear can be rented from dive shops for self-guided fun. Facing the sea at Coral Bay, walk to the right and scramble over the rocks to find many small bays and pockets with good snorkeling. Be mindful of leaving valuables unattended on the beach while in the water. Never touch or kick the reef. Despite what others on your trip, including the guide, may be doing, don't feed or harass marine life while snorkeling. Without question, the place to party is along Long Beach on Perhentian Kecil. The other beaches and Perhentian Besar are much quieter compared to Long Beach. Alcohol is exponentially more expensive on Perhentian Kecil than on the mainland. Bars are often the target of raids by police, so bribes must be paid. If you intend to drink on the islands, consider bringing a bottle of something with you from the mainland. Rum is a popular choice. Prices for bottles in Kuala Besut are only fractionally lower than those on the islands, so consider bringing something from Kuala Lumpur if you're serious about saving money. The default beer, Carlsberg, is comparatively pricey in the Perhentians. The cheapest choice for alcohol and a favorite of backpackers is the ubiquitous "Monkey Juice" (arak kuning) with a slightly sweet taste and 25 percent alcohol content. Captain Stanley is a knockoff of spiced rum with more kick and is also available for cheap. The old wisdom of "you get what you pay for" reflects the way that you will probably feel in the morning. Many restaurants don't sell alcohol, but the staff might allow you to bring your own assuming that you keep it discreet and purchase mixers or other drinks from them. Drugs, although available on the island, are highly illegal as they are elsewhere in Southeast Asia. Since you must bring a lot of cash to Perhentian Kecil, theft can be a problem—particularly for new arrivals staying in the cheapest bungalows with flimsy security. Ask about locking up money and electronics at reception; get a signed receipt for the amount placed inside of lockboxes or use your own lock if possible. Be mindful when leaving valuables on the beach for a swim, particularly in the isolated bays that back up to the jungle around Coral Bay. Petty theft is a serious problem on Perhentian Kecil. Even flip-flops are often a target of theft. Removing your shoes at a bar to dance or leaving them outside your bungalow increases the chances that you'll be picking out low-quality replacements at an overpriced shop the next day. Don't leave bikinis, sarongs, or other items on porches to dry. Mosquitoes are a serious nuisance on the Perhentian Islands, but there are natural ways to avoid bites. Use protection when walking in the island interior and when going for dinner at dusk. Daytime mosquitoes can carry dengue fever. Monkeys, while usually harmless, make raids and have been known to carry off or open bags if they smell food inside. If a monkey grabs something, don't risk a bite by playing tug of war; you'll have to go back to the mainland for injections. The giant monitor lizards that patrol the islands may look like Komodo dragons, but they are actually harmless as long as you aren't crazy enough to corner or grab one. The tap water is not safe to drink in the Perhentian Islands. You can purchase bottled water and take advantage of water refill stations in some cafes and hotels to cut down on plastic waste. Cuts and scratches from dead coral can become infected easily in tropical humidity. Treat even minor scrapes carefully to avoid potential complications. In the interest of safety, women should not walk the jungle path on Perhentian Kecil between Long Beach and Coral Bay alone at night. Although rare, there have been instances of tourists who were assaulted on the trail.